Hanoi (VNA) – The Vietnam Fatherland Front and other socio-political organisations should promote communications work and mobilise resources to better support blind people, helping them improve their livelihoods and well integrate into society, a senior Party official said. Attending a ceremony to mark 50th founding anniversary of the Vietnam Blind Association (VBA) in Hanoi on April 17, Politburo member and Head of the Party Central Committee’s Mass Mobilisation Commission Truong Thi Mai expressed her hope that the Party Committees at all levels, local authorities, and competent sectors will continue their support for the blind community and raise public awareness of their capacity and contributions to society. Relevant agencies should conduct a study in order to adjust current policies and legal regulations relating to people with disabilities, including the blind, she stressed, adding that blind people’s opinions on the issue must be listened to. 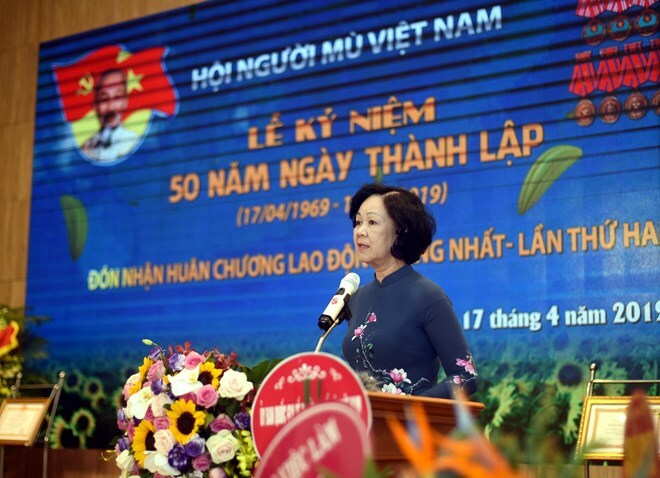 Mai took the occasion to appreciate the VBA’s efforts to overcome challenges and contribute to the national construction and development cause over the past five decades. She believed that the association will be a source of strength and encouragement for the blind community so they can continue their dedication to the country. According to VBA Vice President Dinh Viet Anh, the association now has chapters in 56 cities and provinces with 74,430 members. In particular, the National Fund for Employment have helped tens of thousands of VBA members secure stable jobs and escape poverty over the past 30 years, he said. On the occasion, the State President presented a first-class Labour Order to the association for the second time, and second- and third-class Labour Orders to outstanding VBA members.